NEW YORK, NY--(Marketwire - October 2, 2007) - Randy Jackson, music industry veteran and TV personality, is holding a casting call for people living with type 2 diabetes. Jackson has partnered with the American Heart Association to speak on behalf of The Heart of DiabetesTM, a national campaign to help those living with type 2 diabetes manage the disease and learn about its connection to cardiovascular disease (CVD). Approximately 21 million Americans have diabetes; and according to estimates, two-thirds of them will die of CVD, such as heart attack or stroke. "When I was diagnosed with type 2 diabetes, I thought, 'Wow, I have a serious disease,'" Jackson said. "I've learned that people can live well, with proper management of this disease, and that hearing stories about how others manage type 2 diabetes helps me. I am encouraging people to share their stories as part of The Heart of Diabetes campaign. I hope this campaign will help others who live with type 2 diabetes lead happier, healthier and more fulfilling lives." Through the campaign, Jackson shares more of his story about living with type 2 diabetes and provides information about how to successfully manage it. The campaign calls upon those who either have, or know someone who has, type 2 diabetes to share their tips and inspirational stories on the campaign's Web site, www.IKnowDiabetes.org. Three people with type 2 diabetes, whose stories are inspiring to others, will be selected and invited to appear in a public service announcement with Jackson. Daniel W. Jones, M.D., president of the American Heart Association, noted, "People living with type 2 diabetes often need a comprehensive solution that involves appropriate lifestyle changes and proper medication management. The Heart of Diabetes encourages them to get regular physical activity and eat a healthy diet to help prevent the associated cardiovascular risks common in people living with the disease." "When I was diagnosed with type 2 diabetes, I took a hard look at my life choices and lifestyle habits," Jackson said. "I also worked closely with my doctor to stick to a treatment plan, including learning about healthy food choices and exercise routines. I've learned things that have helped me manage the disease and worked with the American Heart Association to develop tips to help others lead a healthier life." minimize risk of cardiovascular disease. intake of saturated and trans fats, cholesterol, sodium and added sugars. options and lifestyle changes that work for you. "If you have type 2 diabetes or are at risk of developing the disease, work with your doctor to create a game plan for monitoring your critical health numbers including blood sugar, cholesterol, body weight and blood pressure," Dr. Jones said. "It's important to be persistent and ask questions until you find a treatment plan that is right for you." Those who submit their stories on IKnowDiabetes.org by October 21, 2007 will be eligible to appear with Jackson in a public service announcement. 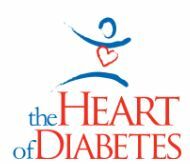 Visit IKnowDiabetes.org for details about how to submit a story and to find educational resources and more information about The Heart of Diabetes. The American Heart Association's The Heart of Diabetes™ campaign is supported by an educational grant from Takeda Pharmaceuticals North America, Inc. Founded in 1924, the American Heart Association today is the nation's oldest and largest voluntary health organization dedicated to building healthier lives, free of heart disease and stroke. These diseases, America's No. 1 and No. 3 killers, and all other cardiovascular diseases claim over 870,000 lives a year. In fiscal year 2005-06 the association invested over $543 million in research, professional and public education, advocacy and community service programs to help all Americans live longer, healthier lives. To learn more, call 1-800-AHA-USA1 or visit americanheart.org.